The good news in banking is that no one has to settle for merely acceptable service and that there are more options for the previously underserved,” said Jeff Blyskal, senior editor at Consumer Reports. When it comes to banking, bigger isn’t always better. A recent subscriber survey conducted by Consumer Reports found that customers of credit unions, primarily online, and smaller traditional banks were more satisfied with their overall banking experience than those who do business with one of the nation’s four dominant mega banks: Bank of America, Chase, Citibank, and Wells Fargo. 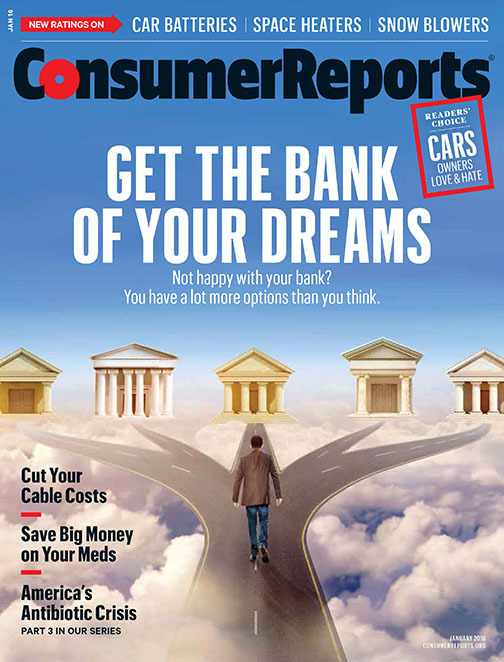 The full report, “Choose the Best Bank for You,” is in the January 2016 issue of Consumer Reports and at ConsumerReports.org. In addition to Ratings of more than 100 institutions, the article outlines the pros and cons of credit unions, big banks, mostly online banks, and smaller regional banks and features a step-by-step guide for switching financial institutions, advice for keeping bank accounts secure, and more. Consumer Reports surveyed more than 49,000 subscribers about their overall banking experiences including customer service, bank communication, consumer complaints, and fees. Credit unions and primarily online banks emerged among the highest-rated services Consumer Reports has ever evaluated, with respectively 93 percent of their customers highly satisfied on average. The Navy Federal Credit Union, available worldwide, and USAA Bank, Schwab Bank, and EverBank, which operate online, were among the highest-scoring in the Ratings. Seventy-seven percent of respondents to Consumer Reports’ survey said they were highly satisfied with the service provided by smaller traditional banks that are more community based and tend to focus more on customer relationships. Frost Bank, based in Texas, was top-rated among smaller banks, and Umpqua, which operates mainly on the West Coast, was noted for its practices that connect its customers in ways beyond banking. While the experience that credit unions, online, and smaller banks provide may be more satisfying overall, choosing one of the big four banks – Bank of America, Chase, Citibank, or Wells Fargo – may be the best option for those who appreciate their nationwide reach and convenience of many branches. Doing business with them can be pricey, but overall, Consumer Reports readers were satisfied with them in general. Open basic checking and savings accounts at a credit union that is a member of a network giving its customer access to fee-free ATMs and online and mobile account access. Check mycreditunion.gov to check membership eligibility. Shop online for credit cards and mortgages because the market for them is national, with lots of competitors. Customers who confine their search to the bank where they have their checking account are limiting their options. Compare Internet rates for certificates of deposit at virtual banks rated by Consumer Reports and at credit unions. Both types of institutions tend to pay the highest rates.